The integration of originally separate, multi-step processes to form integrated manufacturing processes. The integration of various functions, materials and parts to form integrated products. The integration of simulation steps to create integrative simulation chains, which not only look at several processes in an overlapping manner, but also interlink process properties and part properties. Companies in the manufacturing industry are nowadays faced with the task of meeting a wide variety of diverse challenges: In addition to the global competition with low-wage countries, product life cycles are becoming ever shorter, technical requirements are mounting and customers increasingly want individualised products with many different variants. Many established processes and business models will no longer be viable in future and necessitate continuous innovation. Companies in Germany and Europe will only be able to be competitive in the long term if they can maintain a technological lead. The key to this is efficient manufacturing processes and technologically advanced products. The plastics industry recognised at an early stage the potential of integration and is now playing a leading role. Long before the term "integrative production technology" became known, the plastics industry recognised the potential of integration and now plays a leading role in this field. From the beginnings of assembly injection moulding and multi-component technology, development has led to present-day hybrid parts, fully integrated production cells, the intelligent networking of plants and machines, and large-scale automation. The integrative link-up of product development and production is also nowadays regarded as a role model for many other industries. Do you have any questions on this topic? Please don't hesitate to call me or send me a message. Integrated manufacturing processes shorten process chains and enable more economical production. Furthermore, they are often necessary for manufacturing integrated products that would not be possible by conventional means or only at great expense. 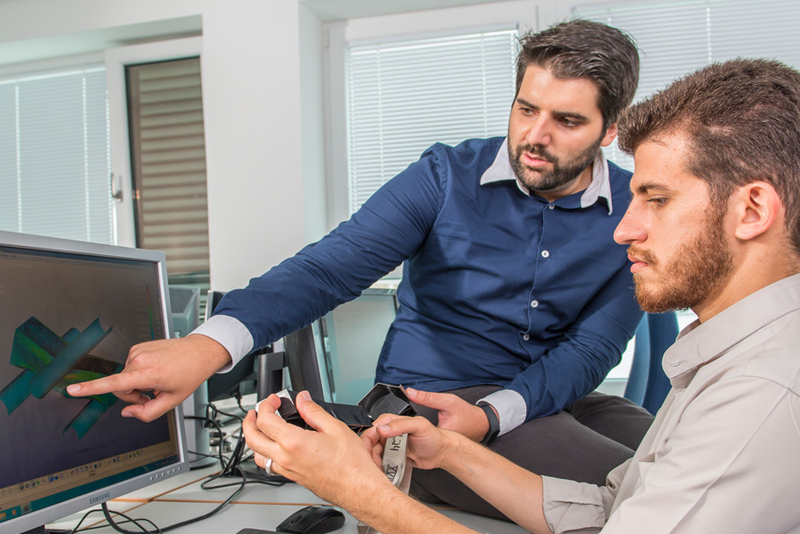 The varied and often complex interactions between material technology and process technology in integrated processes and their specific use are the subject of research at IKV. With a total of 13 partners from different sectors of the plastics industry, IKV will demonstrate at K 2016 the implementation of Industry 4.0 in plastics processing with the aid of a production cell. 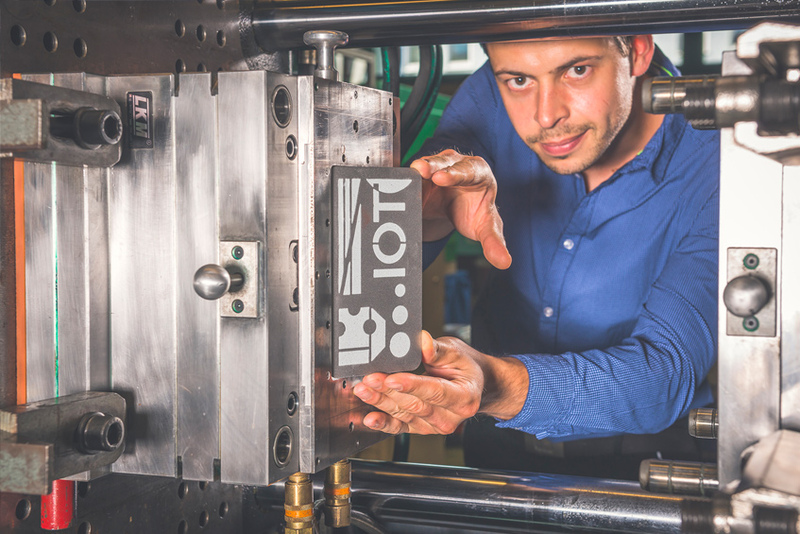 The aim of the project is to show the production of thermoplastic lightweight parts with a number of variants, whereby the entire manufacture is networked in line with the principle of Industry 4.0 and allows full documentation, from order input and production data right through to subsequent quality assurance. Visitors to the trade fair can actively control the production process and select an individualised part from several variants and also have it manufactured. They can vary the production parameters of shot volume, part thickness and type of fibre reinforcement from one shot to the next. The demonstrator at K is an LGF-PP foam that can be optionally supplemented by unidirectional laminates on the upper and lower sides. The ProFoam technology used in the foam injection moulding process ensures gentle processing of the long glass fibre-reinforced polypropylene and, thanks to the large residual fibre lengths in the component, results in consistent implementation of the lightweight construction concept. By combining the robust injection moulding process with the resource-efficient use of continuous fibre reinforcements, an economical process for the customised production of thermoplastic lightweight parts can be attained – adaptable to meet the customer's individual requirements. Whereas plastic/metal hybrid parts for decorative applications can currently be produced by purely forming the melt, this is, with high forming levels, neither economical nor practical for the plastic when used as structural parts because of the high plastic wall thicknesses. One of the steps in the process can be saved by integrating the typical elements of a deep-drawing tool (blank holder, punch and die) into an injection moulding tool and using the closing motion of the injection moulding tool to shape the metal sheet. A metal insert is thus, during the integrated process, first pre-shaped by deep-drawing and then subsequently backmoulded with the plastic melt. The two materials are thus bonded together cohesively during the injection moulding process. In a joint project called "Schaum MRS Reaktor", the partners Gneuss, A. Schulman, Fraunhofer UMSICHT, IKV, Inde Plastik and Trocellen are developing a reactor for the decoupled reactive modification of plastics by the foam extrusion process. The reactor is based on a multi-screw extruder, which, through the large reaction surface and a defined residence time, allows the controlled reactive modification of e.g. PET or PE, decoupled from the rest of the process. The focus of the research at IKV is the determination of suitable process parameters to control the chemical reaction in the reactor and to examine the influence of the modification on the foaming process and the properties of the foam products. The aim is to develop a technology that allows efficient production of tailor-made foam products by integrating the material modification into the production process and thus substituting multi-step process chains. The subject of this sub-project is the examination of a process chain for the production of microstructured plastic lenses, from the optical design of the structures, mould structuring and coating, to the replication process and functional testing. IKV's core competence here covers the analysis and optimisation of the replication in the injection moulding process and the extrusion embossing process with the help of variothermal temperature control processes. Integration of all disciplines of relevance for the manufacture of structured plastic lenses enables a holistic view to be obtained of the production chain to ensure maximum quality in every production step and also in the end product. Within the Cluster of Excellence "Integrative Production Technology in High-Wage Countries", IKV is combining the extrusion embossing process with a variothermal roll temperature control system in order to produce plastic film with micro- and nano-structured surfaces in a single process step. The micro- and nano-scale structures can be used to provide the films with special optical functions, for example "light-recycling". The integration of a multi-step residual monomer degassing with the addition of fillers in the reactive extrusion of polyamide 6 allows the direct production of compounds, starting from the monomer, in a single step. As a result, plastics processors can lower production costs by saving energy. Compound properties can be adapted specifically to the application through appropriate design of the polymerisation process in the reactive extrusion. Direct extrusion of polyamide 6 films starting from the monomer can thus be achieved, thereby extending the process of reactive extrusion beyond polymer synthesis and the incorporation of additives. IKV has more than 20 years of experience in the design of the machine technology and in performing complex polymerisations in reactive extrusion. In an innovative process chain, the LightFlex project extends the product portfolio, which could formerly be defined as combined forming and backmoulding processes, with the mould-independent manufacture of individualised TPC parts based on rapid prototyping structures and individually adapted composite sheet, reinforced according to the specified load resistance. The aim is to accelerate part development and, at the same time, improve the property profile of the parts compared with conventional additive manufacturing processes. Through the mould-independent production approach, savings can be made at the part development phase, especially in the mould technology. In the research project "InPulSE", IKV combines its expertise in the fields of extrusion and fibre-reinforced plastics. In this integrated process, a hybrid profile is continuously produced that combines a rigid lightweight, thermosetting fibre-reinforced core with functional, weldable thermoplastic surfaces, of high optical and tactile quality. The newly developed sandwich RIM process can be used for the production of sandwich parts with flexible (continuous fibre-reinforced) facing layers and a flexible or rigid foam core. The facing material and core material are fed sequentially into a rectangular cavity. By subsequently increasing the volume of the cavity, the core material is given space to expand. With this process, the thickness of the part (6 - 40 mm), the thickness of the facing layer (2 - 4 mm) and the density of the foam core (90-230 kg/m³) can be adjusted over a wide range. Integrating functionalities and utilising different material combinations synergetically are the main drivers behind the use of integrated products. IKV is researching both the design and the manufacture of integrated products based on plastics. As part of the joint project HYLIGHT, an innovative technology has been developed for the economical manufacture of cohesive plastic/metal hybrid structures. For this project, IKV has created a holistic methodology for the material-related design of these hybrid parts. It covers both the development of a suitable testing method (including the specimen) for establishing the properties of the composite and an integrative simulation method with which the fundamental mechanical properties such as stiffness and strength behaviour of the composite can be calculated locally with a high degree of accuracy. The production strategy pursued in the HYLIGHT project reflects the core targets of the integrative production technology. Plastic/metal hybrid parts originated among other things from the motivation for increasing functional integration in weight-saving components. The innovative HYLIGHT process has revolutionised the manufacturing chain and mechanical performance of these parts by using metal sheets coated by the coil coating process, enabling cohesively bonded composites for large-volume series application. Through the combination of metal and plastic to form hybrid parts, it is possible to specifically combine the completely different sets of properties of the two materials. In this way, lightweight, highly load-resistant structures are produced with a high functional density to meet the lightweight design targets demanded by the industry. The aim of this cooperation project is to develop hybrid plastic/magnesium composites. The integration of metal areas on plastic surfaces is made possible by the newly developed in-mould metal spraying (IMMS) process. A research team from IKV is working together on this integrated process with the Institute of Surface Technology (IOT) of RWTH Aachen University. For this project, the processes of thermal spraying of metals and the injection moulding of plastics are combined in a single mould technology. In the first step, a metal coat is applied in-line, i.e. immediately before the injection moulding process, to specific areas of the cavity surface in the injection moulding tool with the aid of thermal spraying. In the next step, this metal layer is backmoulded with plastic. The metal layer is thus transferred to the plastic part in a similar way as in the in-mould labelling process. The metal layer and the plastic are subsequently demoulded together as a plastic component with an integrated complete or partial metal surface. 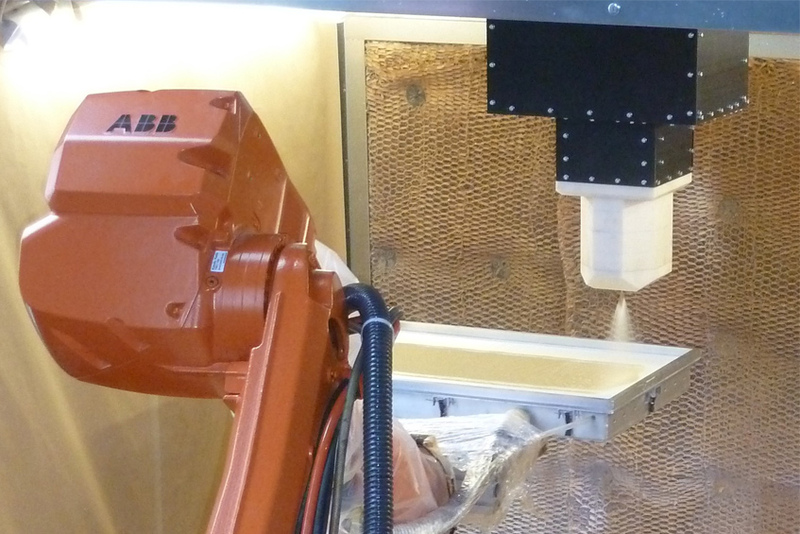 The new technique for metallising plastic parts can offer a much shorter process chain than the conventional processes such as the backmoulding of metal inserts and films. With the integrated metal/plastic injection moulding process (IMKS), conductive tracks consisting of a tin-based low-melting alloy are sprayed onto a plastic carrier. For this process combination, IKV has developed for the first time a metal diecasting unit, borrowed from the micro-injection moulding process, that can be mounted on the mould. Through the combination of plastic injection moulding and metal diecasting, components can be produced with integrated metal conductor tracks on a single mould in an injection moulding machine. The aim of current research is to improve the quality of the conductive tracks. The specific setting of process parameters has a considerable influence on the quality of the part and thus determines the life expectancy and the success of the series application. The developed guidelines for part design and process control are essential for successful implementation of the technology for series production. As part of the Cluster of Excellence "Integrative Production Technology for High-Wage Countries", IKV is working both with partners from industry and with other research institutes at RWTH Aachen University on the sub-project "Hybrid-structural parts", which covers further development of the plastics/metal hybrid technology. The aim of the research activities at IKV is firstly to examine alternative joining processes and secondly to develop new approaches for characterising the mechanical behaviour of multi-material joints under short-term dynamic load. For this purpose, IKV has developed a carrier structure, on which the influence of different small-scale and micro-scale mechanical joints can be analysed under impact load. In addition, an innovative process for describing the mechanical behaviour of thermoplastics under extreme load rates was developed. In the technologies researched at IKV, plastic parts are produced for electronic applications in integrative processes, which eliminate process steps, shorten cycle times and attain greater efficiency overall. With the integrated metal/plastic injection moulding process (IMKS), injection moulding and diecasting are combined on one machine and in one mould in order to produce plastic parts with integrated metal conductive tracks. With the in-mould metal spraying process (IMMS), a metal layer is applied by means of a thermal spraying process directly onto a mould cavity and backmoulded with plastic and transferred, allowing the production of parts with direct EMC protection. The aim of the joint project "LSR-LED" with the partners HELLA KGaA Hueck & Co., Lippstadt, Momentive Performance Materials GmbH, Leverkusen, and ELMET Elastomere Produktions- und Dienstleistungs-GmbH, Oftering/Austria, was to develop an integrated lens of liquid silicone rubber (LSR), which combines the function of the primary lens (encapsulation) and front lens (light distribution) of an LED light source. In a highly integrated process, the LSR lens is sprayed directly onto an unencapsulated LED board. Cost and time-intensive steps to mount the lens on the LED chip thus become superfluous. The focus of the research at IKV was to determine suitable process parameters and to analyse the moulding accuracy of the lenses. Furthermore, it was shown that the optical requirements, even in long-term tests typical of the automotive industry, are satisfied. In the BMBF joint project INNOVATIV-Compound (no. 01LY1512), the partners Eisenhuth GmbH & Co. KG, Allod Werkstoff GmbH & Co. KG, Calorplast Wärmetechnik GmbH, Kessen Maschinenbau GmbH, Protech GmbH and Leibniz-Institut für Polymerforschung Dresden e.V. are developing a process in which the thermally and electrically conductive part of a bipolar or heat exchanger plate is compression moulded from a highly filled thermoplastic compound and subsequently overmoulded with a mechanically load-resistant plastic by injection moulding. Furthermore, complex, fluid-proof heat exchanger geometries with high compressive strength are being developed by a joining process expressly configured for this application in a combined heat and power unit (CHP). The main focus for IKV is to develop a joinable, highly filled thermoplastic compound and to evaluate the suitable joining methodology. The aim of this technology is to integrate bipolar plates and heat exchanger geometries directly into an existing application without the need for additional sealing elements. The integrative simulation chains developed and researched at IKV link together the prediction of the process characteristics with the prediction of part behaviour. It enables the continuous tracking of process influences on the material behaviour and interactions in multi-step processing processes. These methods are key to continuous virtual product and process development. The use of plastics in highly demanding applications necessitates ever greater exploitation of the material's potential. This makes it all the more important to consider local mechanical properties such as anisotropies and crystallinities as well as any mechanical weaknesses caused by e.g. notching and weld lines. IKV is developing new and innovative strategies to be able to map these material properties using methods of integrative simulation, i.e. the coupling of process simulation with structural simulation. To implement these simulation methods, use is made of industrially established software, supplemented by IKV's own tools in key areas such as material modelling in order to create flexible solutions for the material-related mapping of the broad property spectrum of plastics. In many cases, the property spectrum of a plastics part is derived not only from the type of plastic used but also from the manufacturing process. Methods of integrative simulation therefore aim, by interlinking process simulation with structural simulation, to continuously document the information on all significant properties, and thus be in a position to take this into account when designing the part. In the stretch blow moulding process, high-quality plastic hollow parts can be produced with outstanding mechanical and optical properties as well as low weight and low cost. IKV is involved with the entire spectrum of this modern production technology. At IKV, a three-dimensional simulation was developed that is capable of mapping the entire path taken by the preform through the stretch blow moulding unit. It can model, for example, the heating of the preform as it passes through the infrared heating section. The simulation then covers the forming phase, through which, among other things, the wall thickness distribution of the formed hollow item can be calculated. Based on this information, the structural mechanical behaviour of the hollow parts can subsequently be modelled. During their assembly, technical components are often subjected to vibrational stimulations and, as a result, are stimulated to noise radiation. The design of the part with regard to acoustic boundary conditions can be carried out for unreinforced thermoplastics with methods and material models that already exist in commercial structural stimulation programs. Furthermore, research at IKV is concentrated on a material-related acoustic simulation of thermoplastic materials, which allow much better mould detail reproduction. In addition to improving the methods for unreinforced and thus mechanically isotropic plastics, an acoustic simulation of anisotropic short fibre-reinforced thermoplastics was carried for the first time with the help of an integrative calculation method. With the material model developed at IKV, it is possible to calculate both the direction-dependent and frequency-dependent stiffness and damping behaviour of short fibre-reinforced thermoplastics. The advantages of this method become clear particularly on parts with a pronounced fibre orientation. In the IGF research project LFT-Crash, IKV is developing, in cooperation with partners from industry, an integrative simulation chain for mapping the deformation and failure behaviour of long fibre-reinforced plastics under impact load. For this purpose, a user-defined material model and an approach for calibrating the model are being developed. The basis for the research project is a comprehensive characterisation of the three parameters, fibre length, fibre orientation and fibre content in relation to the influence of the strain rate dependence of LFT materials, which plays a decisive role in crash simulation. For this, use is made of approaches developed at IKV for material testing and material data processing, with the aid of which not only much higher accuracy can be obtained compared with standard measuring methods, but also the measuring data can be used without further processing for the calibration of numerical models. This not only results in an improved understanding of the material behaviour of LFT under short-term dynamic load, but also provides a useful approach for mapping the measured effects in the FEM. In this sub-project of the excellence cluster, we are developing a multi-scale simulation chain for describing the crystallisation kinetics of semi-crystalline thermoplastics and their impact on mechanical component behaviour. We are actively cooperating on this with the ACCESS e.V. Research Centre, Aachen and the Politecnico di Bari, Italy. The portion of this simulation chain developed at IKV describes the crystallisation kinetics of semi-crystalline thermoplastics on the basis of multi-scale approaches. The inhomogeneity of the part and the local distributions of the superstructure are taken into account here. The multi-scale simulation thus permits the crystallisation process to be taken into account during solidification and determines the resulting inhomogeneous material properties. This linked description of process and material properties in the simulation is one of the basic elements of integrative production technology.